Allicin is at the heart of why garlic smells so strongly and has so many health benefits. Allicin is a strange little critter (or, you know, an organosulfur compound known as 2-Propene-1-sulfinothioic acid S-2-propenyl ester in the world of IUPC nomenclature) that is at the heart of much of garlic’s magic. Garlic produces allicin but if you examined the composition of a whole clove you’d find absolutely no allicin in it. What you would find are two enzymes called alliinase and alliin. When those two enzymes are brought together — from chopping, mincing, or crushing a clove — they form allicin. 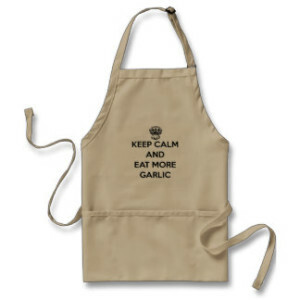 That reaction happens very quickly and the allicin that is produced is what gives garlic it’s distinctive smell. Garlic and other alliums such as onions actually have very little smell before they’re chopped; cutting or crushing the bulb is what produces allicin and it’s strong aroma. Allicin is very unstable and immediately begins to break down after alliinase and alliin come together to produce it. Allicin produces other sulfur-containing compounds such as diallyl disulfide and a thiosulfinate as well as numerous others. Studies have isolated over twenty different sulfur-containing compounds in activated garlic and over 60 total volatile compounds, with little known about all the ways they may interact with the human body. The sulfur-containing compounds produced by allicin are far more effective than Vitamin C in treating a wide range of illnesses. That sounds scary but it isn’t; those compounds and their complex interactions may be saving your life. The complex sulfur-containing compounds that allicin produces are the reason that garlic is effective in lowering cholestorol, reducing elevated blood glucose, and acting as a natural antibiotic — as well as likely being the mechanism behind garlic’s cancer preventative properties. How Much Allicin is in Garlic? 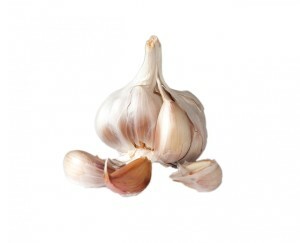 The amount of allicin in a clove will depend on the variety of garlic, with Artichoke garlics typically containing the least allicin while Porcelain varieties have the highest allicin content. The amount of allicin can vary dramatically within types, though, so not all Porcelains will be loaded with allicin. Studies have shown Romanian Red to have some of the highest amounts of allicin among the Porcelains, making it a good choice if you’re looking for a garlic with the most allicin. Key things to remember about allicin is that anything more than light heat can destroy it and it is only activated when garlic is chopped, crushed, or minced and its precursor enzymes are brought together. 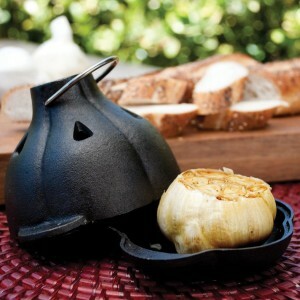 A cast iron garlic roaster is a perfect way to roast garlic evenly each and every time. That means that as delicious as roasted garlic is, it contains absolutely zero allicin and very few health benefits. If that same clove were instead chopped, allowed to sit for 10-15 minutes, mixed with honey, and spread on toast and eaten, allicin and its resulting sulfur-containing compounds would immediately go to work in your body. How Much Allicin Do You Need? 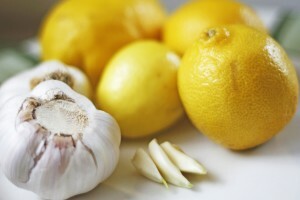 As far as how much allicin you need, a good rule of thumb is to eat a clove of garlic every day. It’s best to eat it raw but lightly sauteing chopped garlic leaves much of its allicin intact. Keep in mind that eating raw garlic doesn’t just mean chopping it up and sending it straight down the hatch. It simply means the garlic isn’t baked or heavily cooked, as raw garlic can be added to warm sauces, salsa, salads, and spreads and still retain most of its beneficial health properties from the allicin and other compounds it contains. Meredith, T. (2008). The Complete Book of Garlic: A Guide for Gardeners, Growers, and Serious Cooks. Timber Press. Eric Block (1985). “The chemistry of garlic and onions”. Scientific American 252 (March): 114–9. doi:10.1038/scientificamerican0385-114. PMID 3975593. Kourounakis, PN; Rekka, EA (November 1991). “Effect on active oxygen species of alliin and Allium sativum (garlic) powder”. Res Commun Chem Pathol Pharmacol. 74 (2): 249–252. PMID 1667340. “Allicin and related compounds: Biosynthesis, synthesis and pharmacological activity”. Facta universitatis 9 (1): 9–20. 2011. doi:10.2298/FUPCT1101009I. Cremlyn, R. J. W. (1996). An introduction to organosulfur chemistry. Wiley. Hahn, G; in Koch HP, Lawson LD, eds. (1996). Garlic: the science and therapeutic application of Allium sativum L and related species (2nd ed.). Baltimore: Williams and Wilkins. pp. 1–24. D. Abramovitz, S. Gavri, D. Harats, H. Levkovitz, D. Mirelman, T. Miron, S. Eilat-Adar, A. Rabinkov, M. Wilchek, M. Eldar and Z. Vered, (1999). “Allicin-induced decrease in formation of fatty streaks (atherosclerosis) in mice fed a cholesterol-rich diet”. Coron. Artery Dis. 10 (7): 515–9. doi:10.1097/00019501-199910000-00012.PMID 10562920. A. Elkayam, D. Mirelman, E. Peleg, M. Wilchek, T. Miron, A. Rabinkov, M. Oron-Herman and T. Rosenthal (2003). “The effects of allicin on weight in fructose-induced hyperinsulinemic, hyperlipidemic, hypertensive rats”. Am. J. Hypertens 16 (12): 1053–6. doi:10.1016/j.amjhyper.2003.07.011. PMID 14643581. Lindsey J. Macpherson, Bernhard H. Geierstanger, Veena Viswanath, Michael Bandell, Samer R. Eid, SunWook Hwang, and Ardem Patapoutian (2005). “The pungency of garlic: Activation of TRPA1 and TRPV1 in response to allicin]”. Current Biology 15 (10): 929–934. doi:10.1016/j.cub.2005.04.018. PMID 15916949.